The Royal Exchange was described by traveller Celia Fiennes in the late 17th century as ' a large space of ground enclosed round the cloisters and open arches on which are built many walkes of shopps of all trades; the middle space below was design'd and is used for the merchants to meet to concert their business and trade and bills, which is all open and on top of these piaza's are the effigies in stone of most of our Kings and queens since the Conquest, from whence this Exchange takes its name Royal' . The original Elizabethan exchange was destroyed by the Great Fire and a new baroque building, designed by City surveyor Edward Jarman, was opened in 1669. 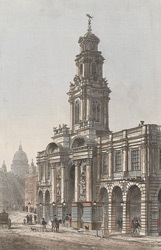 Daniel Defoe in his Tour of the City of London (c.1720), noted that the Royal Exchange was 'finished and embellished in so exquisite a manner'. Although it 'cost the citizens an immense sum of money', Defoe thought it was money well spent. Jarman's Exchange seen here burned down two years later in 1838.